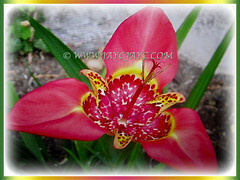 Botanical Name: Tigridia pavonia (syn. : Ferraria pavonia, Moraea pavonia). 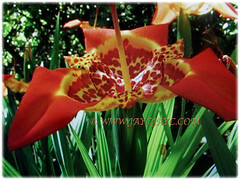 Common Names: Tiger Flower, Jockey’s Cap Lily, Mexican Shell flower, Peacock Flower, Tiger Iris/Flower. Etymology: The genus name, Tigridia means tiger-like and alludes to the colouration and spotting of the flowers. Plant type: An ornamental and hardy perennial flowering plant. 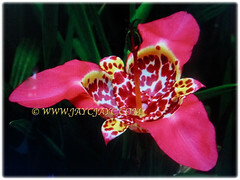 Features: Tigridia pavonia is from the genus Tigridia that consists of approximately 35 species of plants. It can grow between 45-60 cm tall. The bright green foliage has leaves between 25.40-30.48 long. The foliage has upright blade-shaped leaves and produces several flowers per stalk. The lower leaves have longer petioles than the upper ones, up to 1-2 cm long. The blooms come in a variety of colours ranging from red, yellow, pink, rose, lavender and pure white. Its flamboyant flowers will last only a day. But since each plant produces an abundance of stems, the flowering period in reality lasts for several weeks. 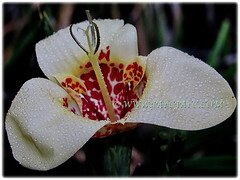 Its flowers are hermaphrodite and are 7-15 cm wide with 3 large one-colour petals flanking 3 small sported petals that emerge from a similarly-speckled centre cup. Each flower is on top of a 45-60 cm tall and slender stalk. 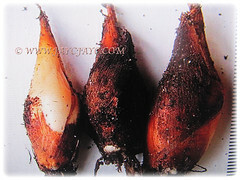 The bulbs are edible and have been used by the Native American Indians in the United States. It has a chestnut-like flavour. 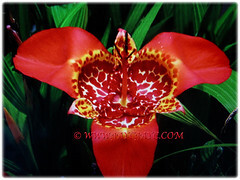 Culture (Care): Tigridia pavonia or Tiger Flower can be easily grown with least maintenance. Light: Best in full sun though tolerates part shade in hot climate areas. Moisture: Medium water requirements. Water regularly but do not overwater. Soil: Humus-enriched, sandy, medium loamy and well-drained soils. It needs no pruning at all. Just remove flowering stalks and withered leaves to keep it aesthetically pleasing. Generally free from serious garden pests and diseases. Nonetheless, watch out thrips that will sometimes disfigure the blooms. 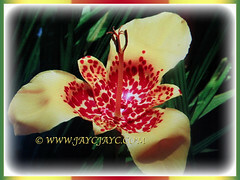 Tigridia pavonia or Tiger Flower is frost hardy. Its hermaphrodite flowers bloom from early summer to late spring. It is a summer grower and dormant during winter. It is a treasure of the mid-late summer garden. To propagate, direct sow the seeds outdoors in fall. 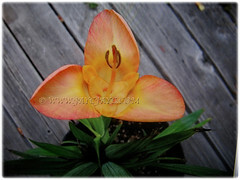 Tiger Flower prefers a sunny site, fertile and well-drained soils. Likes plenty of moisture in the growing season. It cannot grow in the shade. Propagation: By dividing bulbs that produce offsets. Alternately, it can be propagated from seed. 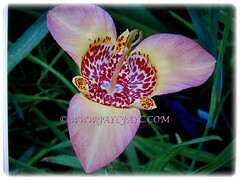 Usage: Tigridia pavonia or Tiger Flower are especially charming when grown in groups in the perennial border where they provide bright colour all year long. Ideal to be planted in a container or grown in the ground. The bulbs are edible and have been used by the Native American Indians in the United States. It has a chestnut-like flavour. The plant has been used to promote fertility.